The 2017 Ruby Vineyard Beneath the Bramble is a single barrel selected from the oldest own-rooted vines (45 years old) on the Ruby Vineyard Estate, planted in 1973. The vines are cuttings from the Eyrie South Block, the first Oregon Pinot noir to win a blind tasting in Burgundy; they are 100% Wädenswil clone 1, rare and hard to find. Five years after this planting, previous owner Bill Beran purchased the 12 acres intending to start a commercial vineyard. Much to his surprise, while he was clearing an overgrown patch of blackberries he discovered a half-acre block of these 224 Pinot noir vines—a serendipitous discovery beneath the bramble. Thirty-nine years later, Ruby Vineyard proprietors Steve Hendricks and Flora Habibi were intrigued by the beautiful dried rose petal and violet aromatics and delicate texture of wine from this tiny block. Ruby Vineyard now bottles the two to three barrels produced each year as a single bottling, Flora’s Reserve. 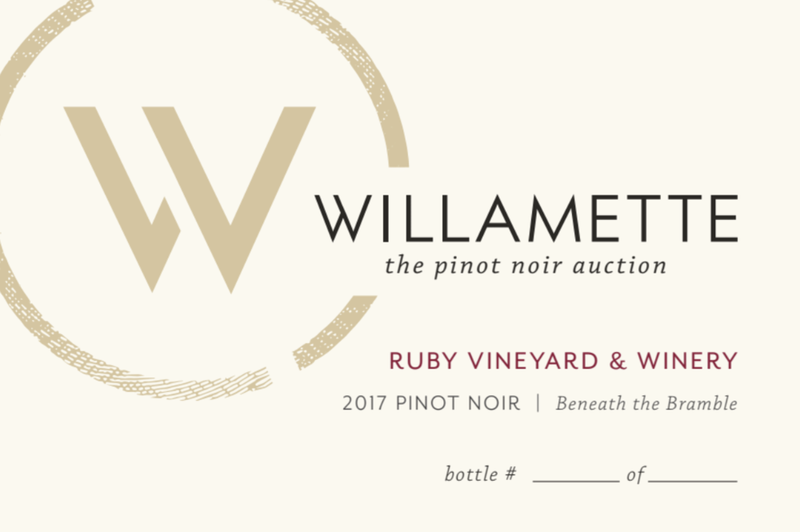 We invite you to enjoy Beneath the Bramble— a Pinot noir lover's Pinot from rare, special old vines. In 2012, realizing a lifelong dream, Steve Hendricks and Flora Habibi purchased Beran Vineyard. The entirety of the vineyard is own-rooted and the average vine age at Ruby is 40 years, with the first block planted in 1973 with source material from the legendary Eyrie South Block. We have three clones of Pinot Noir: Dijon 115, Pommard, and Wädenswil.